To be fair, we're busy creating new features, releasing our teams offering and celebrating teams week, diving deep into concepts like premultiplied alpha. And still, there's no video. Sometimes you have to look at your time and budget (we don't actually have a Matrix-sized budget, imagine that!) and see what's realistic. We were invited to present at a Product Hunt meetup hosted by Big Door—and they needed a video from us so it was time to make the rubber hit the road. The invitees were all companies that had been featured on Product Hunt—have you seen our page? Give us an upvote if you can!—and we needed to show up with something solid. Pretty much every project around here starts with a Limnu board. We create it on our Limnu for Teams account so that everyone has access to it immediately. We sketched out a pretty simple concept, reviewed it with the team, brainstormed the three ideas we wanted to show off, and then made a plan to divide and conquer. Most of the video concept flew together really fast. We wanted to show an intro of someone actually drawing and not just a screen grab of the cursor moving. We wanted to show off how cool it is to jump on a board and collaborate as a team while we draw and video chat. Lastly, we wanted to... hmmmm. We weren't sure. Should we show off our Slack Integration? Sure, that's cool, but we can share the concept in a few seconds or is it too technical? Show how Limnu facilitates remote teamwork? Same problem, it's hard to show that off in a few seconds. We settled on showing off the different browsers and devices that Limnu works on (all of them!). This is where Limnu really comes into play for planning and brainstorming. The planning doc was set up and sent to the team, then we all jumped on and reviewed several options for our third section. You can see several ideas in different colors. Once we'd all agreed it was time to divide and conquer. I put stars on everything I would do, Dave and Grue took assignments and we scattered to pull our deliverables. We were able to keep everything we needed on the same board with notes around the planning sections. Things like what size we needed to make the screens and how long we wanted it to be. The next morning we got together and took a screen video of all of us collaborating and speaking. Dave made the edits, we dropped in the music and we were done! A simple yet polished video to show up with at our event. 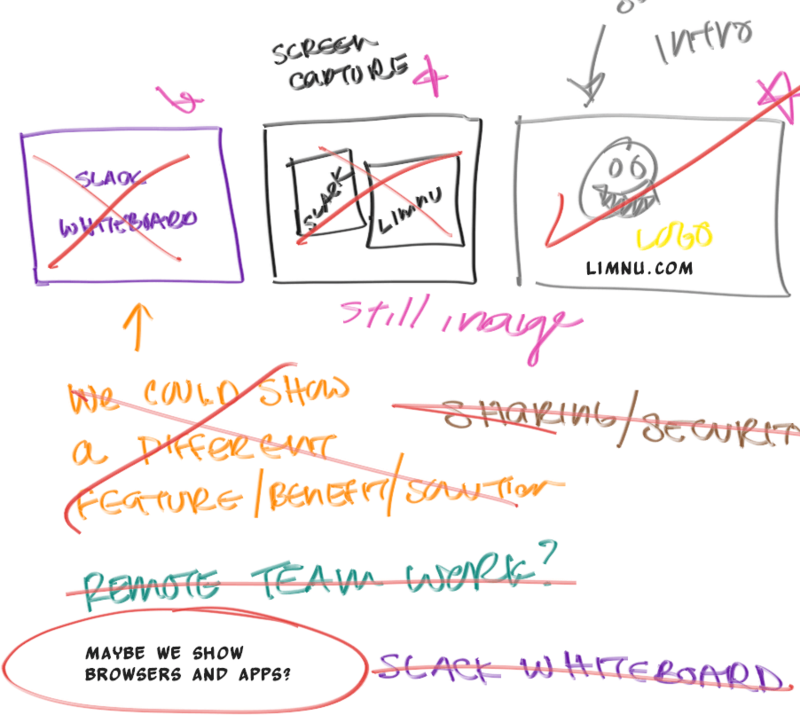 Limnu has infinite edges — which means every part of a project can be on one board. You can see the sketches that are in the actual video are on that same board (including a couple we took video of and rejected). We built Limnu because we needed it. 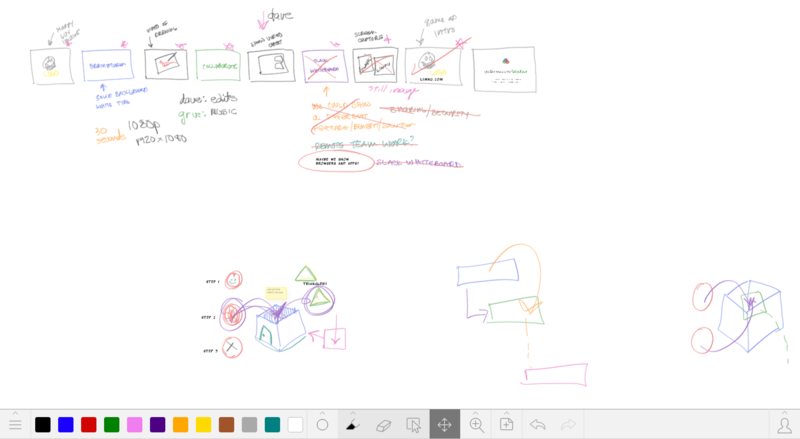 We work remotely, we are visual collaborators, we think sketching an idea and sharing it without a bunch of software bloat is the best way to work. Sound like something your team needs? Check out Limnu for Teams and get a free, 7-day trial on us.